Are the Ten Commandments "NEGATIVE" and therefore a WRONG form of law? OFTEN we hear the basic Law of God impugned as negative, and therefore not good. God is often conceived as a stern, wrathful God, who angrily says to us: "THOU SHALT NOT!" God's truth is sometimes looked upon as "a religion of FEAR," and therefore not desirable for modern, advanced, enlightened man. It ought to be POSITIVE, they say, not negative. Thus God, the Truth of God, the purpose and plan of God, the method of God, and the Law of God are relegated to the primitive, the imperfect — something enlightened man has now outgrown. Modern man thereupon looks upon himself as elevated to a plane of rational thinking, and knowledge higher than God, or Christianity, or God's Law. Of course when we UNDERSTAND, God's TRUTH is the most powerful religion or philosophy there is — it eradicates fear! It is the way of FAITH! But is the negative form, "Thou shalt not," then, wrong? Is it outmoded? Should a PERFECT law contain only "DO's" and "DON'Ts"? Just what is TRUE CHARACTER? Just what is the perfect life? I have defined character — that is, true, righteous, holy character — as 1) coming to the KNOWLEDGE of the true, as opposed to the false values — the right, in stead of the wrong way; 2) making, of one's own free will and volition, the choice to do the right instead of the wrong; 3) the exercise of the will in actually doing the right instead of the wrong. Two things: 1) self-restraint to resist the lower impulses and pulls in human nature — to restrain the self from desires, impulses, habits, or customs which are contrary to the RIGHT WAY; and 2) self-propulsion or determined initiative to drive the self to do those things which ought to be done. In other words, in true character in action there is the POSITIVE and the NEGATIVE. Frequently we read the pitiful, feeble efforts of a man who fancies in his ignorant egotism he is wiser than God, setting forth his idea of TEN POSITIVE COMMANDMENTS. Ten "do's" and no "don'ts." And what do we find? How much character would such a list of "commandments" produce? Just about as much character as an electric light bulb would produce light with merely the one positive wire leading into it. Just about as much character as the male alone, without the female, could reproduce his kind. He might DO a few good things, but all his good things would be nullified and canceled out by the unrestrained evil he would commit. 2. "THOU SHALT NOT make unto thee any graven image, or... bow down thyself to them, nor serve them." This is negative, restraining from either making or worshiping any THING as a god; also from either worship, or obedience to, such false god. To the true God we owe both worship and obedience. Notice the principle of GOVERNMENT in this, as in all the commands. THE WHOLE ISSUE IS ONE OF GOVERNMENT. Adam and Eve rejected God's government, refused His rule over their lives, disobeyed four of the Laws of His government. 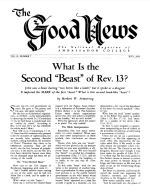 Christ came preaching the "KINGDOM of God," which is the government of God — commanding men to repent of their rejection of that government and the transgression of its laws (sin is the transgression of the law — I John 3:4) — providing the way of atonement for that transgression, and reconciliation to the worship and government of GOD. 3. "THOU SHALT NOT take the NAME of the Eternal thy God in vain." This is a restraint — negative to prevent cutting man off from the POWER and BENEFITS of the right use of GOD'S NAME. If we repent of sin, and come to God by Jesus Christ, He puts within us the impregnating gift of His Holy Spirit, and thus we become His actual begotten children — begotten into HIS FAMILY — bearing HIS NAME (the true name of His Church is Church of GOD) — and having access to all the BENEFITS, BLESSINGS, and POWER of that name. This command is a negative, making possible the POSITIVE and vitally needed blessings thru that NAME! 4. "REMEMBER the Sabbath Day, to KEEP IT HOLY... the seventh day is the Sabbath of the Eternal thy GOD." Here is another POSITIVE command — the only one God specifically commanded us to 'REMEMBER," and the very one mankind insists above all upon forgetting. Is it not an indicting commentary on the unrestrained human nature, and irrational thinking of the self-professed RATIONALS who imagine themselves superior to God, and who insist His Commandments ought to be all POSITIVE and not negative, that this most positive of all the Commandments they flout and disobey with greatest impunity. Again, notice the perfection — here again is a command including both positive and negative, for while it is primarily positive, yet it includes negative restraints to make possible that positive — "in it thou SHALT NOT do any work, thou, nor thy son," etc. 5. "HONOR thy father and thy mother." Do you see any negative statement in this command? Here is a POSITIVE command, with a definite promise of blessing. This heads the six commands regulating man's relationship with neighbor. However, the negative opposite is implied, though not stated. Here is a PERFECT LAW (Psalm 19:7). It outlines, in broad detail, man's right relationship with the true GOD that be my have all the needed guidance, help, and blessings from God; and also man's right relationship toward human neighbors — including parents, children, husband and wife, and all neighbors. This law provides for both WORSHIP of God, religiously, and OBEDIENCE To God, and BLESSINGS FROM God — every need of man for his own good in living, active, continuous relationship with the all-wise, all-powerful, all-loving God. f) Social life — such commands as those respecting adultery, false witness against, coveting. stealing, form the foundation principle of right social attitude and relationship with neighbors. The whole law is summed in one word, LOVE. It is like God, for God is LOVE. Just as His law is LOVE. It was given in love for us, and LOVE is the fulfilling of the law — LOVE IN ACTION.